Although this holiday season was filled with many things to celebrate, it's impossible for me to look back and not see and feel the sadness that overshadowed it. The morning after Christmas, we got the news that my grandmother had passed away in the night. I already know what her responses would be if she knew how Christmas songs suddenly make me sad, she'd say "that is just silly!" as she waved her hand in the air. Then, she'd call me her "Mere Mere" and ask how 'the doctor' was doing, never to forget to ask how Maizy the pup was as well. My grandma, she was something else. Her hugs were famous in our family, we call them "Grandma Stock Hugs." She'd hold on so, so tight and so long that it made you feel like the most special person in the world, always with an extra "squeeze" at the end. Her little 90 lb frame somehow mustered up enough strength to actually give hugs that hurt, in the best way possible. When she'd pull away, she'd look right into your eyes and just smile, squeezing the side of your arms with such joy and pride. I still picture my grandmother the exact same way as I did when I was a little girl, despite the years of memories made since then. Same outfits of cropped fabric pants with a flower print, complete with ironed creases down the center, a matching pink crew neck soft shirt with short sleeves, perfectly curled short hair and glasses. And those slip-on shoes. She loved those shoes, in every color to coordinate with her shirts. I get my particular-ness from her. A sewing room so organized it would make Martha Stewart look like a disaster, every drawer complete with perfectly folded and labeled clothing, a closet that is color-coded by season, her pink towels, clay jugs she collected for years, perfectly placed papers and crossword puzzle books on the side table with a forever sharpened #2 pencil. I can even smell her when I think about her home, those small things that made up a part of her. But those were just the "silly," things- as my favorite memories of her were with my grandfather, Mac. She'd sit on my grandpa's lap and give him a big kiss, always calling him her "sweetie," and he responding with his large smile and a tap on her bum. They traveled the states for years via RV, and you'd think they'd get tired of one another, but not grandma and grandpa. They were like two teenage kids in love, all of the time. Grandma always told me, that before all else, your spouse must be your best friend first. They proved why. I still picture them in their Florida home, sitting in the sunroom watching hockey games together and completing crossword puzzles. When grandpa's vision started to go, grandma would explain what was happening in the games so he could still experience his Red Wings. When he passed, grandma's world turned upside down, and I'm afraid it never turned right side up. She missed her "sweetie." 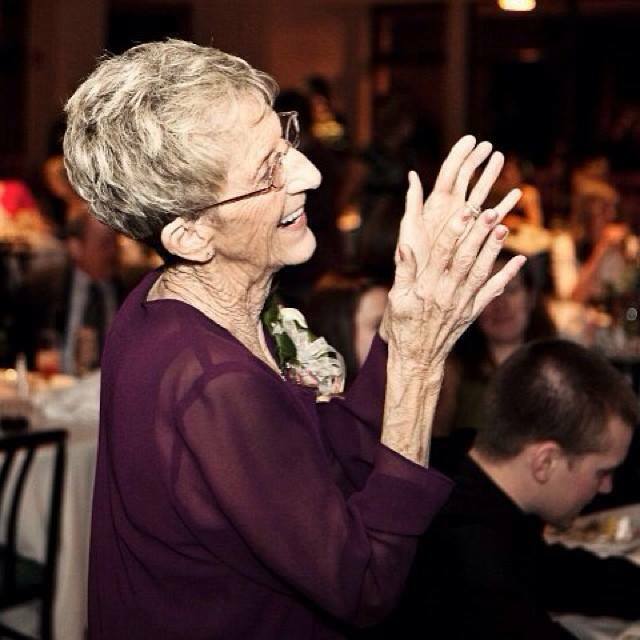 The photo below is from our wedding, and it's one of my favorite memories and moments with my grandmother. This instance, implanted at the forefront of my mind. Dancing with her sister, my mom, and I. Clapping her hands, huge smile, full of joy. I am sorry for your loss. My grandmother passed away last year and I was looking through our wedding photos recently and saw one with her. I immediately started crying. Sometimes you really don't know what you have till its gone. But I am determined to use her wisdom in my life so in a way she is always with me.